Objectives Breast cancer is the most common cancer in women in Qatar. Despite the sustained efforts to increase breast cancer public awareness via campaigns and public screening programmes, breast cancer screening rate remains low. The involvement of community pharmacists in the communication and distribution of breast cancer screening information should have a significant positive impact. The objectives of this study were to determine the degree of community pharmacists’ involvement in breast cancer health promotion activities in Qatar, to explore their attitudes towards the involvement in breast cancer health promotion, to assess their breast cancer knowledge, to gauge their interest in receiving breast cancer continuous education and to list their perceived barriers for including breast cancer health promotion activities into their daily practice. Setting Community pharmacies in Qatar. Method The study objectives were addressed in a cross-sectional survey of all community pharmacists in Qatar. Main outcome measures The extent of community pharmacists’ involvement in breast cancer health promotion activities, the community pharmacists’ interest and comfort in providing breast cancer health promotion, their breast cancer knowledge, their interest in receiving breast cancer continuous education, their attitudes and beliefs towards breast cancer health promotion and their perceived barriers for integrating breast cancer heath promotion activities into their daily practice. Results Over a 12-week period, we collected 195 surveys (60% response rate). Eighty-eight percent indicated that they never invited healthcare professionals to provide breast cancer education in the pharmacy, 78% said that they never distributed breast cancer educational materials, and 58% reported that they never counseled patients about breast cancer. Nevertheless, more than 60% were highly interested in being engaged in breast cancer health promotion activities. In addition, 87% believed that discussing breast cancer awareness with female patients in the pharmacy was beneficial to patients. Yet pharmacists perceived many barriers for integrating breast cancer health promotion into their daily practice including lack of educational materials (79%) and lack of public recognition (61%). Moreover, their breast cancer knowledge mean score was 63% with 77% expressing a high interest in receiving breast cancer continuous education. Conclusion Despite their low involvement in breast cancer health promotion, the majority of pharmacists were interested in educating patients about breast cancer. However, low breast cancer knowledge and other barriers can prevent actualizing this role. Further work should focus on providing these pharmacists with breast cancer continuous education and overcoming all stated barriers. An erratum to this article is available at http://dx.doi.org/10.1007/s11096-016-0341-2. The authors wish to thank the pharmacists who completed and returned the questionnaire. They would also wish to thank Dr. Ahmad Nadir Kheir for revising this manuscript. This publication was made possible by a grant from the Qatar National Research Fund under its Undergraduate Research Experience Program. The authors of this manuscript have no conflicts of interest to declare. The contents of this publication are solely the responsibility of the authors and do not necessarily represent the official views of the Qatar National Research Fund. Breast Cancer Early Detection: Importance of Finding Breast Cancer Early (2009) http://www.cancer.org/docroot/CRI/content/CRI_2_6x_Breast_Cancer_Early_Detection.asp. Accessed 1 Dec 2009. World Health Organization. The Role of the Pharmacist in Self-Care and Self-Medication. 1998. http://apps.who.int/medicinedocs/pdf/whozip32e/whozip32e.pdf. Accessed 1 Dec 2009. Qatar. 2010. http://en.wikipedia.org/wiki/Qatar. Accessed 12 Apr 2010. Qatar National Cancer Society. 2003. http://www.qncs.org.qa/. Accessed 20 Dec 2009. Think Pink. 2008. http://www.thinkpinkqatar.com/tpq_home. Accessed 20 Dec 2009. Iqbal MA. HMC plans high-tech facilities for early detection of breast cancer. 2008. http://archive.thepeninsulaqatar.com/component/content/article/349-qatar-newsarchive/89131.html. Accessed 20 Dec 2009. Huda NV. Breast cancer rates rise. 2008. http://66.132.241.65/Display_news.asp?section=Local_News&month=October2009&file=Local_News200910131655.xml. Accessed 20 Dec 2009. American Cancer Society Breast Cancer Early detection. 2009. http://www.cancer.org/Cancer/BreastCancer/MoreInformation/BreastCancerEarlyDetection/breast-cancer-early-detection-toc. Accessed 19 Aug 2010. Department of Health. Choosing Health through pharmacy–a programme for pharmaceutical public health 2005–2015. London: Department of Health. 2005. http://www.dh.gov.uk/en/Publicationsandstatistics/Publications/PublicationsPolicyAndGuidance/DH_4107494. Accessed 19 Aug 2010. 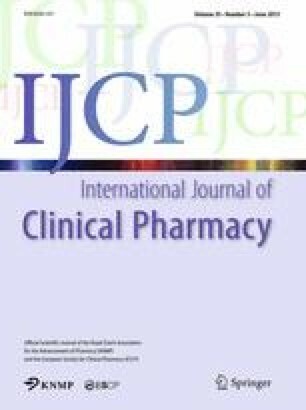 Anderson C, Blenkinsopp A, Armstrong M. The contribution of community pharmacy to improving the public’s health: Report 1:Evidence from peer-reviewed literature 1990–2001. Great Britain: PharmacyHealthLink & RPSGB. 2003. http://www.pharmacyhealthlink.org.uk/files/Evidence%20Base%20Report%201.pdf. Accessed 19 Aug 2010.